‛There is a huge difference between a clinic nurse and a government hospital nurse. Clinic nurses usually do referrals, unlike us, we have to deal with it all – drips, oxygen tanks, two to four injections required to treat a patient with meningitis. We do all of it, from documenting how many patients we’ve seen, to arranging medicines to give to the patients, and monitoring and taking their vitals before doctors do their rounds in hospitals. That’s if a patient doesn’t come in that needs serious medical attention, which is also the work of a nurse – to resuscitate the patient, which could take anything from two to three hours,’ explains Sister Elinor Mpulo (name changed) . hours of the evening. A double shift is also required in a 40-hour-week. The functions mentioned above should be completed before the doctors do their rounds at 8 am; whatever hasn’t been completed before has to be done after the doctors have left. Many days, come 12h00, a nurse hasn’t even had a tea break. The TAC visited the Far East Rand Hospital in Springs after pictures of substandard conditions were sent in by field workers in the area. The images showed patients sleeping on the floor, beds with patients sleeping in passages, patients sleeping in bathrooms with non-functioning flushing toilets, and visible unprotected electrical wiring coming out of the walls. We went to the hospital with the intention of questioning the CEO. He was not on the premises, and so we visited the wards to see the conditions for ourselves. What we saw, confirmed the evidence in the pictures. Hoping to get information from patients about their experiences at the hospital, we found that a majority of them were mental health patients and unable to give us any substantial input. We asked to see to the nurse in charge of the ward who, unlike many in her position who are reluctant to open up about conditions they work under for fear of losing their jobs, or to protect the department, was willing to speak to us. Sister Mpulo, who began nursing when she was 18 and who will soon retire at the age of 55, has seen it all. She spoke to us from the heart, listing the challenges at the hospital and with the entire system. She explained that the main reason behind the overcrowding at the hospital, resulting in some patients having to sleep on the floor and patient beds being moved into the bathroom area, is due to renovations that have been ongoing since 2014. Many patients that come through casualty are told the wards are full and there is a shortage of beds. They are given an option of being given medication and to go home, or to sleep on mattresses on the floor. If they agree to stay, they are made to sign a consent form, to cover the hospital. Up to 62 patients are squeezed into a ward with the capacity to take 31-46 people. Sometimes, the hospital closes admissions to regulate bed capacity. A nurse walks down a Gauteng hospital passage way with a child in this file photo. TB patients waiting for test results don’t know their status when admitted, putting other patients and nurses at risk of contracting TB. 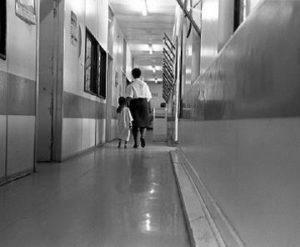 Even the hospital’s TB wards, Sister Mpulo says, are overcrowded, with little to no ventilation. The only way nurses can protect themselves from being infected with TB is to wear their TB masks, something they are reluctant to do because they usually come in one size, are uncomfortable and, when temperatures are hot, it’s very hard to breath while working with them on. Furthermore, the wards don’t have enough oxygen points, and there are not enough drip stands. All these conditions make the nurses’ work very difficult, and the people that suffer the most are the patients, says a visibly exhausted Mpulo. When new doctors are employed, they know nothing about the patients and it’s up to the nurses to bring doctors up to speed on the patients’ records and to ensure that everything runs smoothly so the doctor doesn’t make a mistake. ‛We become burned out and our concentration levels are low. At least, in the last two months, the department has employed some nurses and doctors, which is good. We can only do so much – many nurses take sick leave before they reach a state of burnout. A nurse at a clinic is required to see one to eight patients but at a hospital level we see anything from 12-20 patients a day. The conditions we work under strip away a nurse’s calling,’ she says. Previous PostPrevious The DA’s alternative health plan for South Africa: Yes or No?